TSWREIS inter Admission Notification 2018 integrated coaching for IIT-JEE/EAMCET/NEET/CA-CPT/CLAT- 2018-19 Last Date to Submit Online Application Form extended upto 07-01-2018 tswreis.telangana.gov.in Telangana Social Welfare Residential TSWREIS Admission Test for Intermediate With integrated coaching for IIT-JEE/EAMCET/NEET/CA-CPT/CLAT- 2018-19: TSWREIS Entrance Test Notification 2017 For admission Into Junior Colleges- Apply Online . 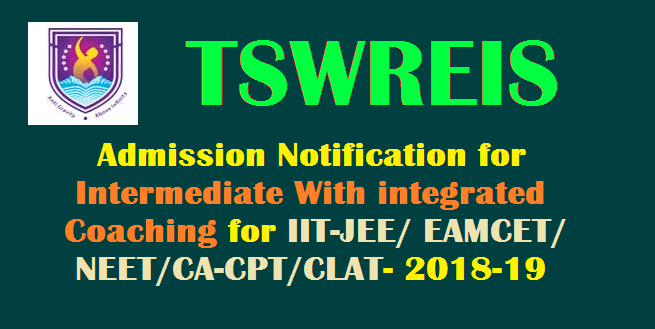 Telangana Social Welfare Residential Colleges Admission Test Notification for the Academic Year 2018-19 in Junior Colleges of the Society all over Telangana | Online Application Form Submission at TSWREIS Official Website http://cet.cgg.gov.in/ TSWREIS Entrance Test 2018 for Admission into Inter with Integrated Coaching,TS Social Welfare Eamcet IIT JEE Coaching Admission Test Notification, TSWREIS Admission Entrance Test 2018 www.tswreis.cgg.gov.in details is as follows Applications are invited from Boys and Girls for admissions into 1st year. Applications are invited from Boys and Girls for admissions into 1st year intermediate MPC (with IITJEE/EAMCET coaching) and BPC (with NEET Coaching) and MEC/CEC (with CA-CPT, CLAT, Admission into Other Prestigious Institutions and Other competitive exams) with English as the medium of instruction for the academic year 2018-2019. The following Institutions are functioning with the above courses under the TSWREI Society. Last Date to Submit Online Application Form extended upto 07-01-2018.